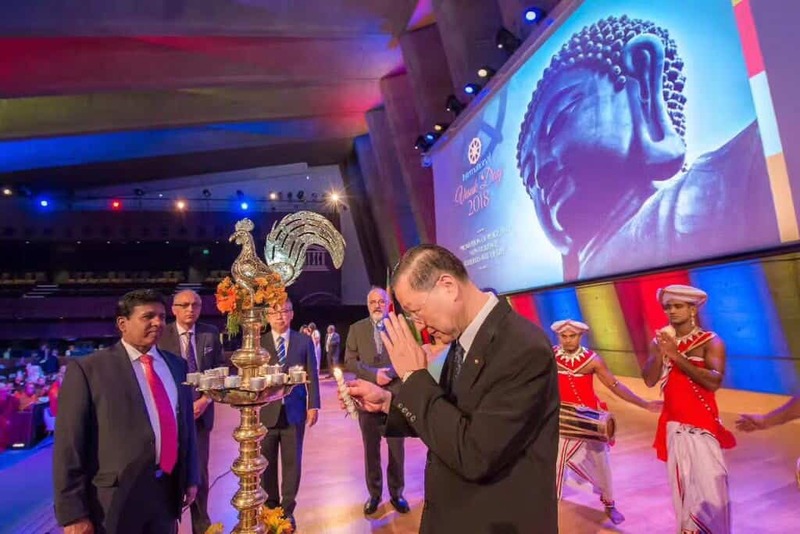 The 2018 Commemoration of United Nations Vesak Day was held at UNESCO headquarters in Paris, France on 24 May, 2018. 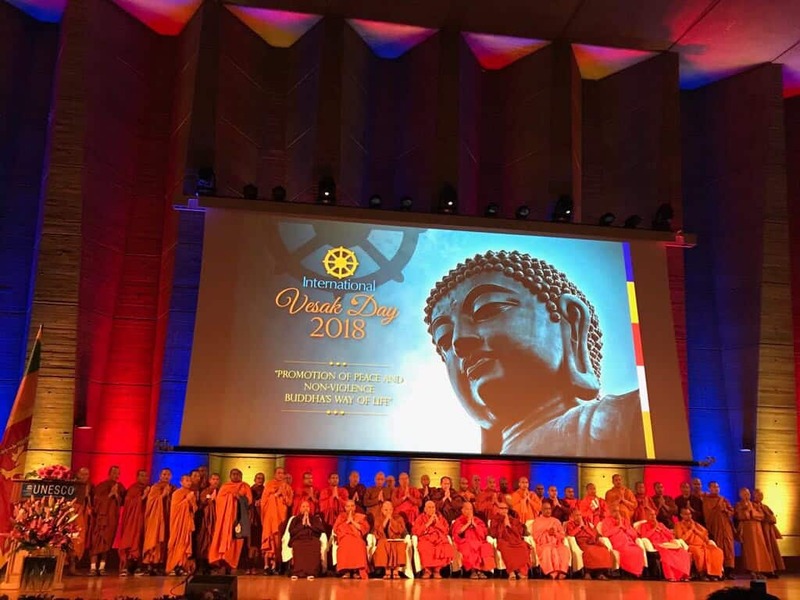 It was attended by nearly 1,000 distinguished guests, including UNESCO officials, ambassadors, politicians, leaders of the religious community and esteemed Buddhist clergy from over 20 countries and regions around the world. The theme this year was “Promotion of Peace and Non-Violence: Buddha’s Way of Life”. Sessions were held to promote intercultural and interfaith dialogue for sustainable peace. 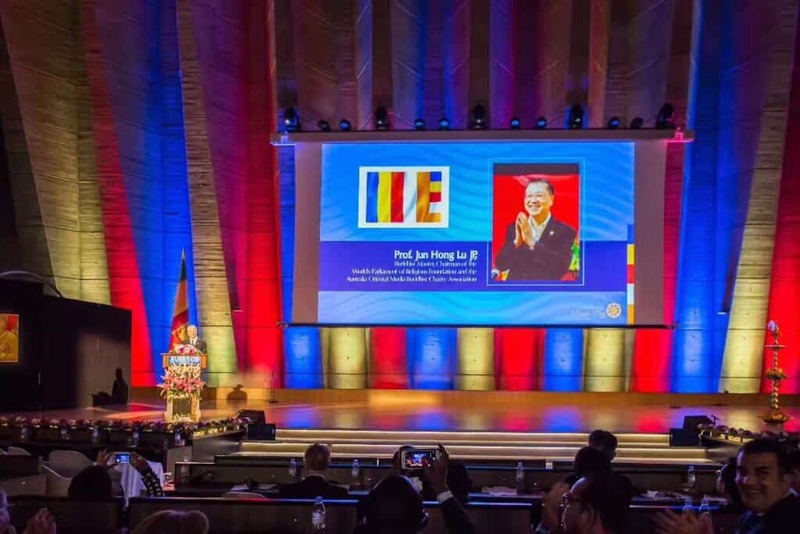 Professor Jun Hong Lu JP, the world-renowned spiritual teacher and Chairman of both the World’s Parliament of Religions Foundation and the Australia Oriental Media Buddhist Charity Association, was invited as a special guest to give a keynote speech. The Vesak Day is an important event in the Buddhist community. 2018 marks the 2607th anniversary of the attainment of enlightenment of Gautama Buddha. In 1999, pursuant to a decision taken at the 54th session of the UN General Assembly, the UN recognised Vesak as an international day of observance. It is now observed annually by the international community. In keeping with the principles articulated in the constitution of UNESCO in promoting peace and security, it was suggested that a UNESCO symposium/roundtable be initiated to bring together member countries of UNESCO. This promoted an interactive dialogue to transcend barriers of faith and culture to achieve peace at a time where societies across the world face mounting pressure from changes and new challenges. 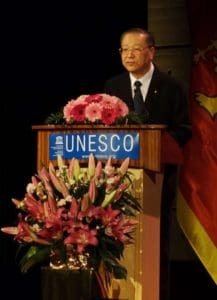 The event provided an ideal platform to convey the universal principles and values taught in Buddhism. Dignitaries were warmly welcomed by dancers and drummers in traditional costumes. This one-day celebration comprised three parts: The Opening Ceremony in the morning, the Meditation Session and Panel Discussion in the afternoon, and Cultural Performance in the evening. The formal proceedings of this auspicious event began at 9.30am with an oil lamp lighting ceremony. Dignitaries and leaders of the religious community were invited to light the oil lamps. Prior to a song in praise of Buddha, Buddhi Athauda, Ambassador and Permanent Delegate of Sri Lanka to UNESCO, delivered the welcome speech. Mr Athauda gave an introduction to the United Nations Vesak Day observance and the way it is commemorated by several countries. With pictures of the key moments of the Buddha’s life displayed on the screen, a choir took the stage, praising the Buddha with a song in multiple languages. Dozens of the senior representatives of the Buddhist monastic communities of the Theravada and Mahayana traditions then chanted the Three Refuges and the Heart Sutra, respectively. Participants rose from their seats and put their palms together to pay homage to the Buddha, immersed in the deep and transcendental sound that reverberated through the hall. Representatives from Christian, Muslim, Hindu and Jewish communities were also invited to deliver messages of love and peace. They all affirmed the great contribution Buddhism has made to humanity, and emphasised the relevance and significance of Buddhist values in modern society, such as equality, non-violence and peace. These are the values shared by Buddhism and other major religions. They also highlighted the importance of education, multiculturalism, and interfaith dialogue with open-mindedness in the harmonious development of humanity. In his keynote speech, Minister of Higher Education & Cultural Affairs of Sri Lanka gave a detailed description of the Four Noble Truths, the Five Aggregates, and other key Buddhist teachings, and how they contribute to mental and spiritual well-being. Permanent Delegate of Japan to UNESCO pointed out that the essential Buddhist teaching—love—is the way to resolve hatred in our world. Both men highly commended the wisdom of Buddhism and its far-reaching impact on our hearts and souls. Also featured in the opening ceremony was a dance performance that recounted the story about how Prince Siddhartha finally decided to renounce his royal status and luxurious life to seek enlightenment. The meditation session in the afternoon was conducted by the Most Venerable Parawahera Chandarathana Nayaka Thera, Chief Incumbent of the International Buddhist Centre. It was followed by a symposium and panel discussion attended by Buddhist scholars from Myanmar and the University of California, Berkeley, USA. The afternoon session was joined by Buddhist monastic communities of various traditions, other leaders from the religious community and peace-loving personalities. The evening featured a vibrant stage performance of song and dance from the many cultures in attendance, including Sri Lanka, China, Germany, France, Japan, the Netherlands, and Spain. It was another highlight of the 2018 Vesak Day celebration for a full house of nearly 1,000 attendees. Combining classical and contemporary elements from each culture, the three-hour performance delivered an evening of stylish enjoyment. With the Buddhist teachings in the hearts of the participants, the event concluded on a positive note with messages of interreligious harmony and intercultural understanding espoused by UNESCO.